Terrascapes is experienced in the construction of houses up to DPC level including all underground services, drains and sewers. We can help you with a small extension to your property or the foundation work to a new build house. We work with a number of building/developing companies and help in the construction of individual new build properties or the construction of a new housing estate. When the houses are nearing completion we can come back and do all the hard and soft landscape works to the external areas of the properties which helps complete the final look of all projects. 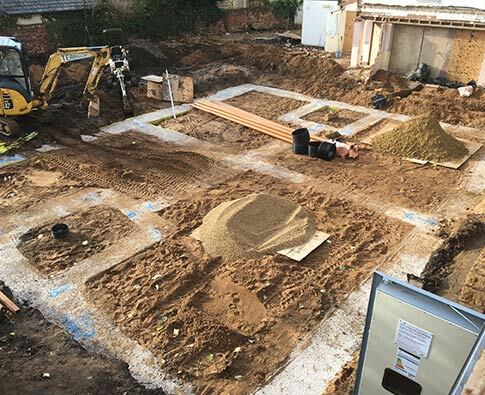 Our groundwork team is capable of constructing all the types of foundations including traditional strip foundation, ring beams and raft foundations. If required we can also organise the installation of piles. Once we have finished the foundations and built up the necessary brick and blockwork we can install the required floor whether poured concrete or block and beam. We are experienced in the installation of foul and storm water drainage systems, including but not limited to soakaways and pumping stations. Terrascapes can finish off the look of a new or old property by completing all hard and soft landscaping areas within the gardens or shared spaces.